Load Balancing -: Load balancer accept request from external client and forward them to one of the available Backend servers according to a scheduling algorithm. 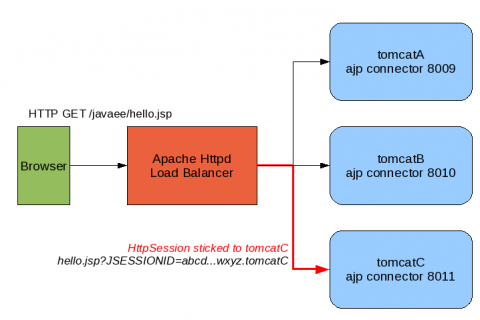 Sticky Session- A single user always deals with the same backend server. Windows-: Download mod_proxy modules and copy in modules directory. Linux- Download mod_proxy modules and run following command for compile. Now create the httpd-proxy-balancer.conf file in the “/etc/httpd/conf/httpd.conf” and add the following lines. A load factor will be applied member of the cluster, in order to define and sharing load balancing between members of cluster. In the following example 40% of the requests will be forwarded to the first and reaming 60% will be forward to second cluster. SESSION_ID is the name of the variable at the application level storing the session identifier.